These benchmarks contain a few flash drives, hard drives, and a solid state drives for comparison. These benchmarks were done with suggestion from Rudy (thanks! - his website) This test was done to see if using Windows 7 ReadyBoost is actually worthwhile loaded on a flash drive on a laptop (or even PC). First up is my relay micro flash drive from Staples. It only sticks out of the laptop about 3/5 of a centimeter, which is great because I can leave it in without accidentally snapping it off. Amazon sells SanDisk micro flash drives that look as if they're the same ones but cheaper under a different brand. Anyhow, here's the result! At this point, judging from the higher read speeds of lower sized files, I'm going to make a hypothesis that, ReadyBoost is a tool on my laptop. While I admit maybe it's a placebo effect, my laptop has seemed a little more responsive and every bit helps. 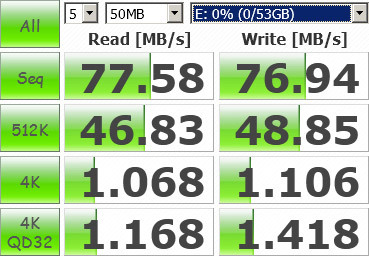 I liked testing these drives, so I ended up testing more. 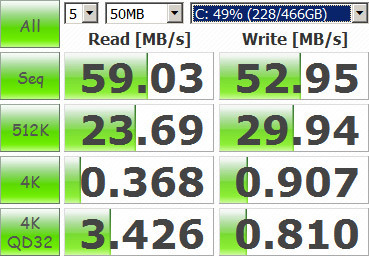 A small partition on this drive was tested, hence "53GB"
Finally, my solid state drive (SDD) was tested, blowing everything else out of the water. It's not the best SSD, but for the price I got it at the time, it's still the best improvement I've recognized to PC's in probably 10 years. I'm just glad I have regular HDD's for storage since this one's only 120 GB. In the end I'm pleased with the results. 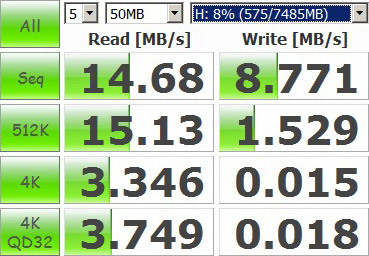 Though I wish the flash drive performed better, I'm still glad it seems to be improving laptop responsiveness a little. 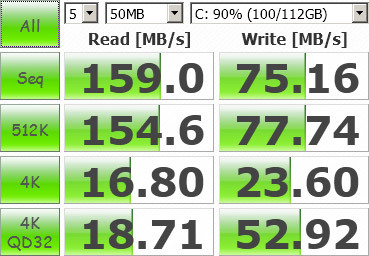 There's of course no question that ReadyBoost is only useful where there is no SSD, but HDDs will be around for a while and with those cheap new PCs on the market (occasionally $100-$200), using Windows 7, an old flash-drive may find new life. If anyone has some wisdom to share, I'd love to read it! I'm a novice in this area and only able to form broad hypothesis at this time! Looks like the Staples Micro 4GB has pretty good 4k write speeds for a flash drive. I was going to use a SDHC class 6 that I plug in the built-in SD reader, but its write speeds were 4k: 0.034 and 4k-qd32: 0.034 - which is kinda pitiful. Thanks for your follow-up. 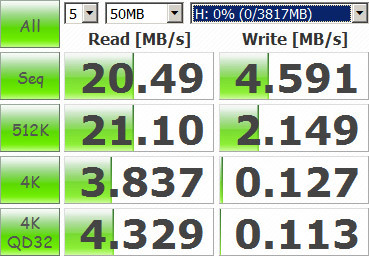 I am using the same flash drive on a 2gig duo core Win7 64bit rig. I have noticed a nice increase in applications starting, and when I play my Cod2, the maps do indeed load faster. The rig starts up about the same, but multi-tasking is better also. Say I have CS5 running, and an open browser with several tabs going. Very nice and smooth compared to without the ReadyBoost. There's currently a sale on Sandisk Cruzer 16GB (low profile) flash drive for $15! That's less than $1 per gig! I just ordered it so I'll perform the benchmark when I get it. Hosted by HostNine This page was created in 0.00390410423279 seconds.